1.0 Streets shall be designed Euro-Style with 300-ft right-of-ways, benches, and flowered traffic circles, to provide a distinct sense of beauty, regardless of cost. 1.1 There shall be a canopy of trees and these shall be your favorite: Giant Royal Palms, 25-ft high, whereas their fronds shall meet in cathedral-like arches with a continuous breeze that shall slip in our sleeves and flutter against our bodies so as to produce angel-like sensations of eternity. 1.2 There shall be bushes, and these shall also be your favorite: Tea Roses @2-ft o.c., to provide enough blooms for casual picking; whereas said blooms shall spy on us from crystal glasses set next to the stove, over coffee-table books, or in front of mirrors. 1.3 Sidewalks shall be crack-proof and 15-ft wide for continuous, side-by-side conversations; painted either a) Sunflower-Brown, b) Mango Blush, or c) Rosemont Henna; whereas such colors shall evoke, respectively: the color of your eyelashes, of your palms, the shadows on your skin. 1.4 There shall be an average of one (1) Parisian-style café per city block, where I shall meet your eyes, dark as espresso, above the rim of your demitasse, and hold your hand like a music box underneath the table; where we shall exercise all those romantic, cliché gestures we were always too smart for. 1.5 There shall also be one (1) open-air market per city block to facilitate the purchasing of tulips, mints, baci, and other typical items to lavish on our lives; whereas every night I shall watch you through a glass of brandy as you dice fresh cilantro and dill, and disappear into the scent steaming around you. 1.6 Utility poles and structures that obstruct our view shall not be permitted. At all times we shall have one of the following vistas: birds messaging across the sky, a profile of mountains asleep on their backs, or a needle-point of stars. 1.7 There shall be an Arts District and we shall float through gallery rooms on Saturday afternoons perplexed by the pain or conflict we can’t feel in a line or a splatter of color (works that glorify or romanticize tragedy shall not be allowed). 1.8 There shall also be a Historic District to provide residents with a distinct sense of another time. We shall live there, in a loft with oak floor and a rose-marble mantle where our photos will gather, and our years together will compete with the age of the brick walls and cobblestones below our vine-threaded balcony. NOTE: In said city, there shall be a central square with a water fountain where we shall sit every evening by the pageantry of cherubs, where we shall listen to the trickle of their coral mouths, where I shall trust the unspoken, where you shall never again tell me there’s nothing here for you, nothing to keep you, nothing to change your mind. 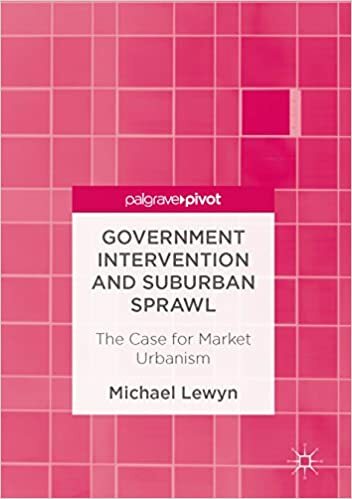 This book shows how suburban sprawl is at least partially a consequence of government spending and regulation, and suggests anti-sprawl policies that can make government smaller and/or less intrusive. Thus, the book responds to the widely held view that automobile-dependent suburban development (also known as “suburban sprawl”) is a natural result of the free market and of affluence, and accordingly cannot be altered without massive government regulation. The Urban Institute Launches Online Policy Debate: Land Use Regulation: What's it Worth Anyway? Today, the Urban Institute launched an online policy debate on "Land-Use Regulation: What's It Worth Anyway? ", which will be live until Monday, July 24, at 5 pm ET. It features several critics of land-use regulation and several advocates of land-use regulation, including the Land Use Prof Blog's very own Tony Arnold. The link to the policy debate is: http://www.urban.org/debates/land-use-regulation-whats-it-worth-anyway. In the much anticipated Cleveland National Forest v. SANDAG decision, the California Supreme Court split the baby yesterday on major planning issues including the adequacy of climate change analysis in state environmental impact reports and, more importantly, the underlying question of how seriously the state will take efforts to integrate land use and transportation planning. For the uninitiated, California's SB375 was a landmark piece of legislation that required the integration of land use and transportation planning...at least on paper. What was never certain was whether SB375 had an enforcement remedy for failure to take the process seriously. In this vein, an important question was whether the state's environmental review law, CEQA, could act as a de facto enforcement mechanism even if SB375 provided no remedy. That is what made the Cleveland National Forest case such a big deal: it would answer that remedy question on what to do if land use and transportation proceeded apace without considering one another. We emphasize the narrowness of today's holding. Our decision is not a general endorsement of the adequacy of SANDAG's EIR, much less an endorsement of the adequacy of the regional plan that the EIR analyzes. Specifically, we do not address whether SANDAG's responses to the indisputably significant greenhouse gas impactsof the 2011 regional plan were adequate. The Court of Appeal concluded that the EIR failed to sufficiently consider feasible mitigation measures and project alternatives that would reduce vehicle miles traveled and curb the rise in greenhouse gas emissions. These issues are not before us, and we express no view on them. We hold only that SANDAG, in analyzing greenhouse gas impacts at the time of the EIR, did not abuse its discretion by declining to adopt the Executive Order as a measure of significance or to discuss the Executive Order more than it did. Moreover, we caution that our conclusion that SANDAG did not abuse its discretion in its analysis of greenhouse gas emission impacts in the 2011 EIR does not mean that this analysis can serve as a template for future EIRs. Under CEQA, “[t]he determination of whether a project may have a significant effect on the environment calls for careful judgment on the part of the public agency involved, based to the extent possible on scientific and factual data.” (Guidelines, § 15064, subd. (b).) As more and better data become available, analysis of the impact of regional transportation plans on greenhouse gas emissions will likely improve. Indeed, SANDAG explains that its EIR, in analyzing its 2015 regional transportation plan, “was able to account for many factors in the GHG inventories that were not accounted for in 2011, reflecting ‘additional certainty regarding the regulatory environment, including future projections of renewable energy, building energy efficiency, water conservation programs, and solid waste diversion.” A regional planning agency like SANDAG, charged with assisting the implementation of the state's climate goals, must straightforwardly address in the relevant environmental review documents whether its regional transportation plan as a whole is in accord with those goals. Its capacity to do so will likely improve over time. *11 Furthermore, after briefing was submitted in this case, the Legislature in 2016 enacted Senate Bill No. 32 (SB 32) (2015–2016 Reg. Sess. ), adding Health and Safety Code section 38566, which adopts a goal of reducing greenhouse gas emissions by 40 percent below 1990 levels by the year 2030. This 40 percent reduction is widely acknowledged as a necessary interim target to ensure that California meets its longer-range goal of reducing greenhouse gas emissions to 80 percent below 1990 levels by the year 2050. (See Governor's Executive Order No. B–30–15 (Apr. 29, 2015) [explaining the significance of the 40 percent reduction].) SB 32 thus reaffirms California's commitment to being on the forefront of the dramatic greenhouse gas emission reductions needed to stabilize the global climate. The legislation directs CARB to craft regulations to implement its goal. (Health & Saf. Code, § 38566.) These regulations may further clarify the way forward for public agencies to meet the state's 2050 climate goals. This regulatory clarification, together with improved methods of analysis, may well change the manner in which CEQA analysis of long-term greenhouse gas emission impacts is conducted. In sum, nothing we say today invites regional planners to “shirk their responsibilities” under CEQA or other environmental statutes. (Dis. opn., ante, at p. 16.) To the contrary, we affirm that planning agencies like SANDAG must ensure that CEQA analysis stays in step with evolving scientific knowledge and state regulatory schemes. CLEVELAND NATIONAL FOREST FOUNDATION et al., Plaintiffs & Appellants, v. SAN DIEGO ASSOCIATION OF GOVERNMENTS et al., Defendants & Appellants; THE PEOPLE, Intervener & Appellant. CREED-21 et al., Plaintiffs & Appellants,, No. S223603, 2017 WL 2980146, at *10–11 (Cal. July 13, 2017). In short, SANDAG won, but they may not win next time, and no one can rely on this decision. After the years of waiting for the decision, whether California will take land use and transportation planning seriously, and its commensurate effects on climate change, remains an open question. Each year, the Rocky Mountain Land Use Institute (RMLUI) convenes land use experts and practitioners at the Western Places/Western Spaces conference to discuss the biggest issues facing communities across the Rocky Mountain West. We cover everything from tiny homes to large landscape conservation, urban planning to rural economies. As land use practitioners—legal, planning, academic, or non-profit—you know the challenges we're facing first-hand, so who better to guide the content for the conference? We are currently seeking proposals for the 2018 Western Places/Western Spaces conference, which will be held March 8 & 9 at the University of Denver. Please read on to learn more about this year's event. How do we plan for the future when we don’t know what it holds? This is a common dilemma for planners and land use practitioners everywhere. Despite the best-laid plans, new practices or technology can disrupt the entire process. Cities are experimenting with smart technology and driverless cars. The suburbs are facing a changing landscape as the rise of e-commerce is leading to the closure of both the big box stores and Main Street shops. In rural areas, landscape managers are tracking livestock and grazing patterns using drones. In addition to all the change being brought about by technology and innovation, communities also have to contend with the disruptions brought on by natural processes. In a world full of disruptions, how do we build infrastructure and craft policies that not only meet our present-day needs, but also have the flexibility to adapt to future scenarios? These questions will help frame our discussions at the 2018 Western Places/Western Spaces conference. The deadline to submit proposals is Friday, August 25. Please visit the RMLUI website to learn more about the conference theme and topics, as well as instructions on submitting your proposal. You will be able to download the Session Guidelines, which contains a description of the themes and tracks for the 2018 conference, as well as information about the conference, guidelines for crafting your proposal, and the criteria used to select sessions. Each year, RMLUI attracts 500 land use professionals and practitioners from the Rocky Mountain West to the University of Denver campus. Now in its 27th year, the conference has become the place for land use and development professionals from private practices, local governments, non-profits, and educational institutes to share knowledge and network. You can view programs and materials from previous conferences on the RMLUI website. Videos from the 2017 Western Places/Western Spaces conference, Creating Inclusive Communities, are available to download through the Home Study Program. Our conference is not possible without the generous support of our sponsors. These financial contributions help fund our programs and conference activities, including providing top-notch keynote speakers, plenary lunch events, and tours. Conference sponsorship provides visibility and underscores your company's commitment to sustainable communities and informed and ethical land use and development practices. For more information, please contact Susan Daggett. Do you teach the 1916 NYC zoning ordinance (NYC ordinance) and/or the Standard State Zoning Enabling Act (SZEA) and, if so, what do you want the students to understand? While these two pieces of legislation provide an abundance of teaching opportunities, in this short blog I’d like to explore them as opportunities to hone students’ ability to analyze land use laws. Throughout law school, students have significant exposure to cases and case analysis. They often have less exposure to legislative interpretation and even less exposure to state and local legislative interpretation. Many land use lawyers’ practice, however, is focused on interpreting local land use codes and the relevant state statutes, often for purposes of presenting before boards and commissions or negotiating with local governments. The NYC ordinance and the SZEA offer students a great opportunity to hone critical legislative interpretation skills necessary for any land use attorney. In a business district no building or premises shall be used, and no building shall be erected, which is arranged, intended or designed to be used for any trade, industry or use that is noxious or offensive by reason of the emission of odor, dust, smoke, gas or noise; but car barns or places of amusement shall not be excluded. This provides an opportunity to elucidate some of the short-comings of nuisance law and the differences between nuisance and zoning. It also provides a reason to delve into the text and discuss legislative interpretation. The text of the NYC ordinance and SZEA also provide an opportunity to discuss legislative interpretation in the context of state authorization. Keeping the excepts concise, we provide enough of the SZEA to illustrate how state statutes authorize local governments to zone. For example, the excerpted portion of the SZEA authorizes local zoning of height, area, and use. Building off the SZEA provisions, the students can be asked whether the NYC ordinance would comply with the SZEA. As the excerpt in our book illustrates, the NYC ordinance provides classic Euclidean zoning (before it was Euclidean zoning), consisting of use restrictions (section 2), height limitations (section 8), and area restrictions (section 10). The text of the SZEA also helps establish a foundation to understand and study more recent changes in zoning later in the course. In Chapter 7, for example, we discuss Smart Growth, New Urbanism, Form-based Zoning, and others. As we cover these newer approaches, it is helpful to ask the students whether they would fall within local authority as laid out in the SZEA; and what, if any, additional authority local governments would need to pass such new forms of zoning and what that authority might look like. Following the NYC ordinance and SZEA we discuss the police power and power to zone in Carter and Goldman and, most notably, in Euclid and Nectow. While these cases help describe the basics of zoning and its legality, covering the NYC ordinance and SZEA first help contextualize the cases. They help paint a more complete picture of the laws at issue before evaluating their legality. I am on a local neighborhood association board here in Boise. About fifteen years ago, some enterprising members of the association went through the complicated process of getting the appropriate licenses to place flag holders on historic street lamps on Harrison Boulevard, the most prominent residential street in the city. For most of that time, when volunteers were available, the association flew the American and Idaho flags on several occasions, primarily Memorial Day, Independence Day, and Labor Day. It was always a volunteer effort, and it didn't always happen, but when it did, it was beautiful. I live on Harrison Blvd. why didn't I get information about the gay pride flags on my street? Don't we have any say on matters that affect us, sure thought we did. I am a 100% disabled veteran, where are the American flags for flag day ? We are North End property owners and have in the past been so appreciative of the Association’s efforts to display the appropriate state and national emblems on special occasions. Kudos to those responsible. We recently noticed the many rainbow flags on the intersections on Harrison Boulevard. This was totally unexpected and surprising to us, given the history of patriotic pride usually on display. Assuming we all know what these current flags are about, I am still hoping that they will not be in evidence during the annual June 14thcelebration of Flag Day, honoring the stars & stripes of our country. Please replace the current emblems with the star spangled banner being honored nationwide on Flag Day. Rainbow flags: I hope these flags will be removed by Wednesday -- Flag Day. I want to see the American flag!!! And that is just some of the responses we got. Clearly, the intent was to force a removal of the rainbow flags through an appeal to patriotism. Notably, none of those insisting that the association fly the American and Idaho flags had ever volunteered previously and the flags had never been flown on Flag Day in this volunteer effort. But I write this story on Independence Day to highlight the admirable folks in my association. Because they did not give in to the effort to remove the rainbow flags, but they also did something that so often seems missing in our national politics. They found a third way: quite literally. Late, on the night before Flag Day, two of the association members went out, standing on a ladder in the back of a pickup truck in the dark, and placed American flags in a third holder in the posts that typically goes unused. They did it to make people happy who had, well let's be honest, picked a fight. And so, on Flag Day, there were two pride flags on each light fixture, and one American flag. The night after Flag Day, the same two volunteers went out with the pickup truck and the ladder, and they took down the American flags once Flag Day was over. The pride flags stayed the rest of the week. It was an incredible amount of work on their part. But it said something remarkable. It said that we weren't going to back down on the pride flags, but we also took the others who wanted to see the American flag on Flag Day seriously. We held firm to our values, but we also did what we could to make others feel like they were recognized on a day that mattered to them. At the end of the day, it's really about how we relate to people who aren't like us that live in the same places we do. Today's hyper-partisanship seeks to build a world where such third ways can't ever happen, but if we move beyond ideology, most of what divides us is a lot like the flags we fly, and many times, those flags look good together. In rounding out this discussion of how to teach the interplay between nuisance and zoning, I thought I would focus on the case of Shore v. Maple Lane Farms (p.14), a 2013 Tennessee Supreme Court case that is probably the least well known case in this chapter. I may be the biggest proponent of this case in the country: according to Westlaw, the case has only been cited twice in academic literature, and both times by me. I want to explain why I think it is such a good teaching case. Second, I like the case because it is a tour de force of nuisance doctrine. The excerpt in the casebook, which was expertly edited by Jon Rosenbloom, provides just the highlights. But it must be said that the Tennessee Supreme Court outdid itself in clearly presenting the basic tenets of nuisance law. There is plenty of Prosser and Keeton, Restatements, and even a shout-out to Dean Salkin’s treatise on zoning. If you want a black letter definition of nuisance, which is really how we use the case here, Maple Lane Farms is a great option. In addition, Tennessee nuisance law hews close to national norms. This is helpful for me because Idaho nuisance law is filled with some quirky provisions. Maple Lane Farms is a useful comparison to illustrate the general rules from which I can then discuss the idiosyncrasies of local law. I supplement with Idaho law in class and we discuss how certain provisions of local law differ from the norms stated in the Tennessee case. Third, I like this case because it involves the interplay between common law nuisance and state right to farm statutes. Most, if not all, states have adopted a right to farm statute, and the Tennessee statute at issue in this case is the model language that was adopted by most states. These right to farm statutes are generally believed to protect farmers from nuisance claims, but the facts of this case present a chance to closely read a statute with relation to common law. Close investigation discovers that the statute only provides a “presumption” of an agricultural operation not being a nuisance, and moreover, that the presumption only applies to those activities that relate to the “land, buildings and machinery” used in “farm operations.” Is an amplified music concert a “farm operation”? The court here holds no, which permits the common law nuisance claim to proceed. But the Tennessee Supreme Court’s decision to permit the nuisance claim to advance invites other questions about “use” that take us into the question of what constitutes “zoning,” which is the fourth reason I love this case. What is “agriculture” in the state right to farm statute, and what is “agriculture” as it might be defined by local zoning codes? For instance, many agricultural nuisance cases discuss noise, but they typically have to do with farmers getting up early and using their tractors at hours when most residential dwellers are asleep. In this case, if the noise were generated from tractors or the agricultural operation, it would clearly be preempted by the right to farm statute. But we are not simply regulating “noise,” but a “use.” Here, the noise comes from an amplified music concert. That difference in the use matters because it explains why the nuisance claim is not preempted by the right to farm statute. There is another aspect of “use” at issue here. The lower appellate court had held that amplified music concerts were “farming operations” sufficient to permit protection under the right to farm statute. The appellate court noted that the changing nature of agriculture meant that most farmers did not make their livings anymore exclusively from traditional farming. Indeed, Maple Lane Farms made 75% of its income from its agritourism operations. If non-traditional operations are necessary for most farmers to survive financially these days, should we come to view such operations as tantamount to an “agricultural use,” or are these “accessory uses,” or are they wholly incompatible uses that should not be permitted here? What is the relationship between regulating uses and changing business models of traditional industries? In short, Maple Lane Farms provides a professor the chance to open numerous avenues of discussion that will be picked up later in the course with greater detail. Note: in another part of the case not excerpted in the casebook, the Tennessee Supreme Court also interprets the local county zoning code and determines that amplified music concerts do not fit within the definition of “agricultural” uses in that code. The analysis is similar and virtually redundant to the right to farm statute analysis, which is why it is not provided. However, a professor that wanted to illustrate uses in the zoning code could also supplement the excerpt with that section of the case.